After that somewhat stressful interview, we went to Akoanso to interview the chief of their town as well. 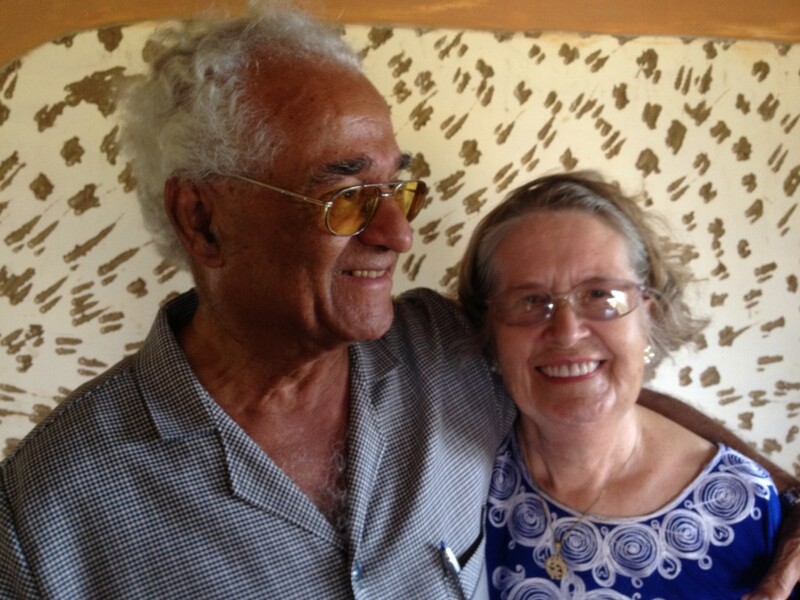 His interview went spectacularly well, unsurprising as the school is being built in his town and the woman building it, Faustina, is his niece. He answered all our questions and told us he could “continue until the sun goes down” if we thought of any more questions for him. We didn’t continue for nearly that long though – we had our third and final interview for the day to complete, with the Queen Mother of the area. The Queen Mother helps to support the women and children of 64 communities that make up the Anomabo Traditional Area. Queen Mothers do everything from coordinating family planning training to helping to set up a school in one of their communities. 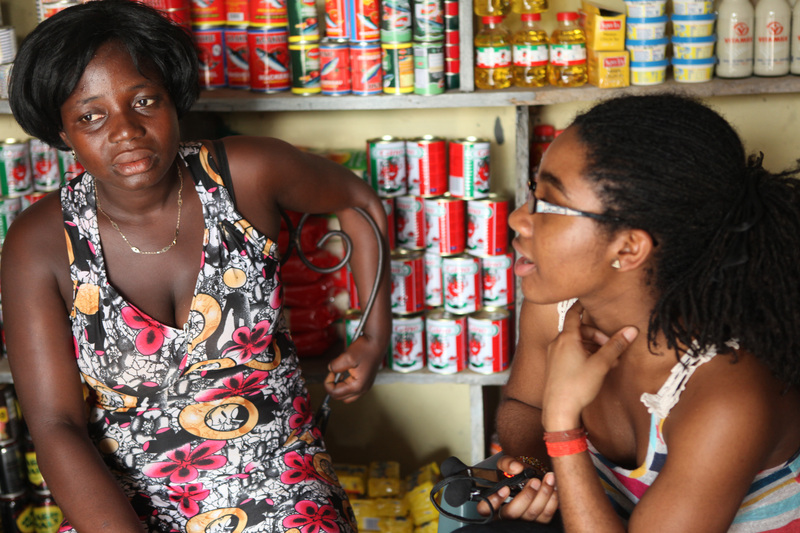 Nana Sakyiwaa spoke to us about the problems of teen pregnancy, the barriers to education, and the girl to boy ratio in schools, among other topics pertinent to our project. After her interview, we went back to the eco-lodge, where our favorite chef had yam chips with tomato sauce and chicken awaiting us for lunch. 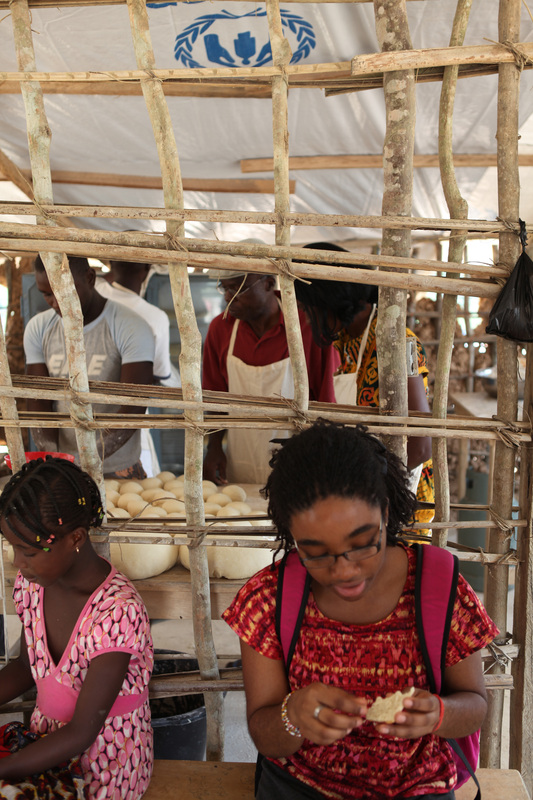 In the afternoon, some of us joined chef Fausti for her usual trip to the market in Cape Coast. It was quite a maze – Paul, Jiwon, Yaa and I bumped in to everything and were pretty much constantly in the way, but Fausti was patient with us. The market was a somewhat overwhelming cacophony of sights and especially smells, particularly the butcher shop. We searched unsuccessfully for mozzarella cheese for the mud-oven pizza we planned to make the next day and ended up buying cheddar instead. We also finally got to experience a tro-tro on our way back the Kobina Ansa. The tro-tro is a super cheap form of transportation: a van with a driver and a fare collector, all of which have different destinations that are yelled out of the window by the fare collector. They tend to be crowded and falling apart – our particular tro-tro had a side door that was so rusted through that there were holes in the metal and it refused to close without serious effort from the collector. Just before dinner, Isaac surprised us with visitors from the refugee camp, including two men who we were beginning to consider friends. He also brought two new guests, including a refugee who was incredibly musically talented and played a few of his own songs on guitar while singing for us. We ate dinner with them, groundnut (peanut) soup by the ever-talented Fausti. 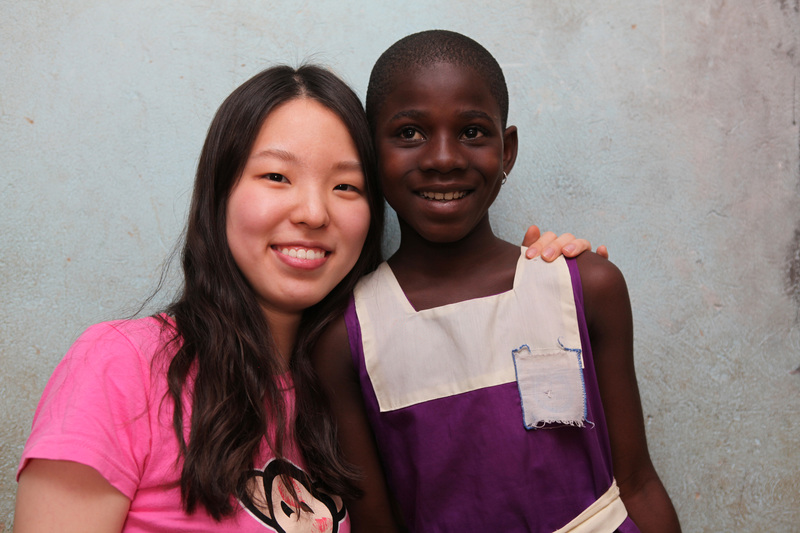 Unfortunately, the peanut fumes in the air kept Zoe from eating with us (she’s extremely allergic), but she was able to join later when we taught the refugees a few American card games, including BS and King’s Cup. After a long, lovely evening, we reluctantly went to bed, knowing we had to be up early the next day to continue our work. We arrived in Ghana at 5:30am, and were greeted by festive green and red arches as we made our way through the airport towards immigration. Christmas music played as we wait for our baggage, which came shrink-wrapped by the airline for reasons unknown. Yaa picked us up from the airport, along with Isaac and Yaw, a Ghanaian man who will be accompanying us for most of the trip. We headed to Yaa’s house to pick up JP, who had arrived the previous day. From Yaa’s house we drove about three hours to the eco-lodge we’re staying at in the central region of Ghana. 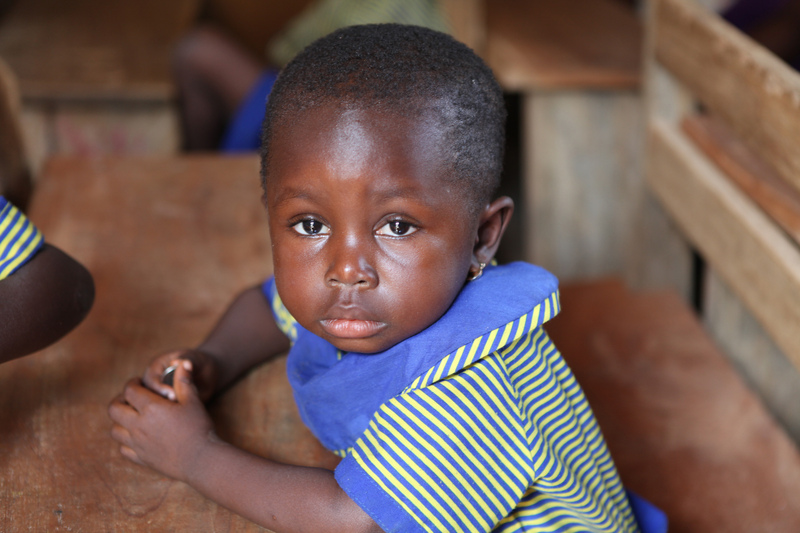 The lodge is located right by one of the villages that the school will serve, specifically Kobina Ansa, the village that Isaac is considered a member of. The huts we are staying in are simple, clean, and pretty, built sustainably from mud with thatch roofs. We eat lunch at the lodge, cooked by Fausina, who will be making all our meals while we’re here. It’s delicious – chicken with veggies and jaloff rice. 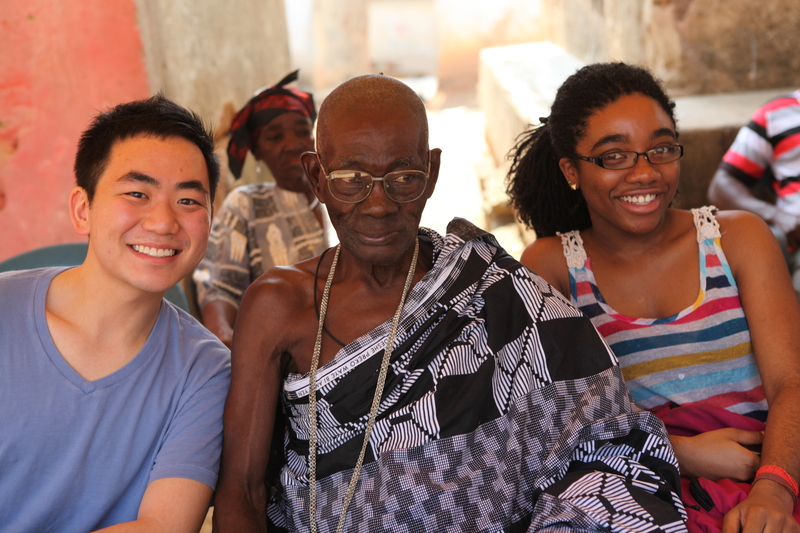 After lunch we headed to the village to meet with the chief of Kobina Ansa, called Nana. The meeting was formal and we had to speak through a linguist (Yaw), who speaks to the chief’s linguist. Linguists are not simple translators, which would be unnecessary as the chief speaks and understands English quite well. Instead, they are meant to make our words cleaner, and put them in language appropriate for the chief’s ear. Occasionally, Isaac did cut in to speak directly to the chief, which seemed to be deemed acceptable since they have been friends for over a decade. After we informed the chief as to why we are there, the chief’s linguist poured out a libation in the courtyard, calling on God, Mother Earth, and the ancestors. We then passed around a cup of liquor to symbolize the connection between everyone in the room. Everyone drank from the cup (though declining was not frowned upon) and some poured a little on the ground for the ancestors. All of us headed back up to the lodge after that, as we were all pretty jet-lagged and in desperate need of a nap. We met up again for dinner, another tasty meal cooked by Fausina of groundnut soup with beef and rice balls and kenke (the staple food in the region made of fermented corn dough). After dinner we headed to Yamoransa, a nearby town, with Nana to attend a traditional religious celebration. We visited the shrine of the traditional priest hosting the event, and gifted him a bottle of schnapps. The meeting was quite similar to our visit to the chief’s palace in the afternoon – linguists, libations, etc. Since the religious celebration had not started yet, we walked over to a nearby outdoor dance club. Most of us sat, talked, and sipped soda, but Paul eventually got up to dance and completely blew everyone in the club away with his break-dancing. We left a bit after 10 to see if the celebration had begun, but were told the drummers necessary for the celebration had not yet arrived. We sat in a courtyard and watched some of the children from the town drum instead – not a bad substitute, as the children in town are incredibly good a drumming despite the fact that some looked as young as 5 years old. Sadly the ceremony ended up starting too late for us to participate, so we left around 11pm to go back to the eco-lodge and off to bed. Ghana is considered a beacon of democracy for West Africa. But when the December 2012 Ghanaian presidential elections went to court based on allegations of fraud, Ghana’s Ivorian population began to panic. Supporters of the National Patriotic Party (NPP) candidate Nana Akufo-Addo are claiming National Democratic Congress (NDC) incumbent John Mahama, who will be sworn into office Jan. 7, had not garnered a majority among Ghanaian voters. The electoral dispute spoke to the people from Côte D’Ivoire of another defining moment in recent history, a conflict that would displace and claim the lives of many citizens of the world’s leading cocoa producing nation. Rather than see Ghana experience turmoil similar to the elections aftermath in Côte D’Ivoire, many of the refugees living in Ghana’s United Nations refugee camp decided to risk returning to their homeland, even though their friends and family remaining had warned them mass killings of young men, students and members of the Bété clan (former President Gbagbo’s group) were still rampant. A refugee we spoke to claimed that hundreds left the camp last month, but a UNHCR representative told us that in the entire history of the camp, they had officially discharged only two refugees. In 2011, Côte D’Ivoire was divided in two over a disputed election; the northern rebels recognized Alassane Outtara as the president while the south recognized Laurent Gbagbo — whose 2011 platform included a project to bring chocolate factories onto Côte D’Ivoire’s soil. Gbagbo had served 10 years in office, the maximum allowed under the nation’s constitution, but because the country had been in conflict during the last election cycle, he had never been elected to his second term. Gbagbo decided to run again with mass support from Côte D’Ivoire’s student population. Meanwhile, according to the refugees, Outtara, whose economic plan would maintain the country’s relationship with and dependence on France, had come to Côte D’Ivoire from Burkina Faso to aid a development programme and quickly fixed his eyes on the presidency. Quite vehemently, the refugees accused Outtara of finagling his way onto the ballot despite his country of origin. When Outtara, who had garnered support from France and the UN, was declared the winner, thousands of Côte D’Ivoire citizens screamed fraud. Young men holding student cards were denounced as militants and killed on the spot, and those lucky enough to make it across the border into Ghana took up lives at UN refugee camps. The Egyeikrom refugee camp was the site of our trip’s visit for the day. The camp houses about 1,600 refugees according to the UNHCR. Some sleep in tents on site, while others have found homes elsewhere in Ghana but return to the camp for monthly rations of rice, soy and other mixtures of grain. Upon arriving at the camp, we learned from the UN representative that refugees can come and go as they please and are encouraged to find work outside the camp or establish businesses — such as a hair salon, a clothes shop, or a restaurant — on site. Just as we were about to start a tour of the camp, Adolphe, the director of the camp’s unofficial secondary school decided to help show us around. 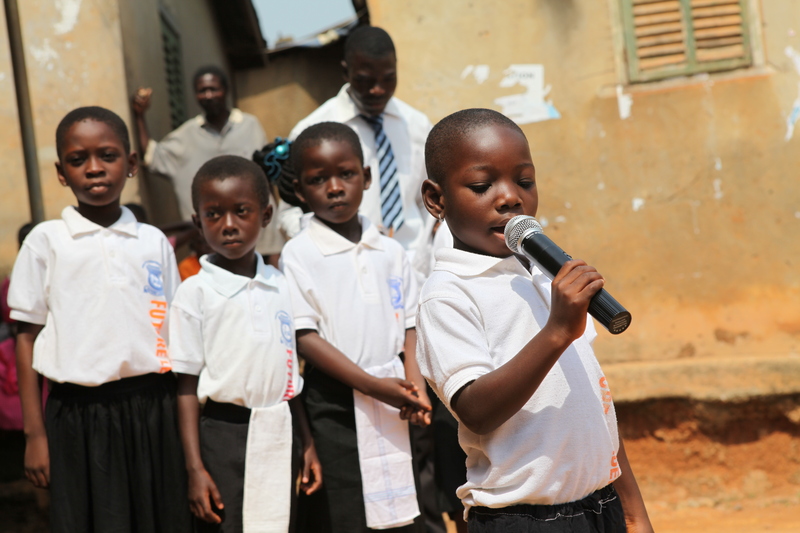 Adolphe explained that the UN recognized the primary school, but his school received no aid, and therefore the students could not afford the examinations needed to advance their careers. He added that the school could not attract enough teachers, and language barriers meant most refugees would need to travel to Togo to take assessments in their native French. Adolphe said he would welcome help and oversight from the UN or the government to provide better opportunities for his students, who essentially attend school for personal enrichment alone. We stopped at the camp’s health center and almost walked in on one of the nurses as she was about to inject a patient. 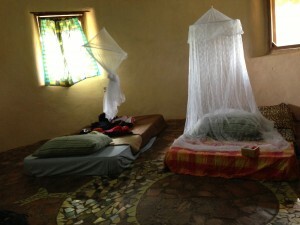 We spoke instead to a child healthcare worker, who explained the camp’s largest health problem is malaria. The facility has two nurses, one doctor and 12 volunteers, plus an ambulance to transport patients to a hospital if necessary. 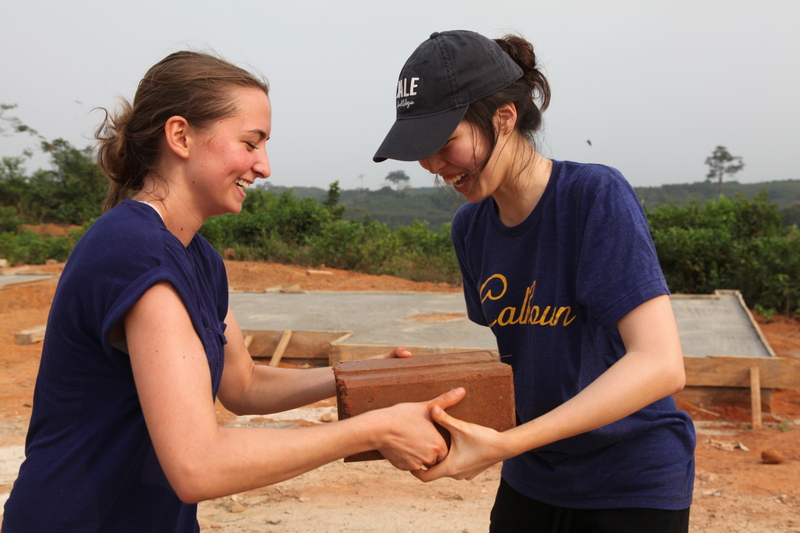 After the initial interviews and before we began construction work at Isaac’s housing site, our hosts took us on a tour through the camp’s communities to give us a sense of the culture and lifestyle. Many of the houses’ bricks were crumbling, and tents became so hot that most refugees preferred to stay outside during the day. As we walked around, children ran up to slap us high five or ask us to take their picture. They giggled as we showed them their image on the display screen. Becky brought along a bright blue Polaroid, so she could print images for the refugees to keep. A highlight of our journey through the camp was when we stopped at the local bakery, where several apprentices who had allegedly learned from a master baker were kneading round pieces of dough for French style baguettes. We ordered five loaves and enjoyed hot bread fresh out of the oven. We then headed to another tent for some entertainment. A group of about 15 men performed a few songs on drums while we sat sweating in a large tent that had cans of soda hanging from a string and a well-stocked pantry on a single shelf. 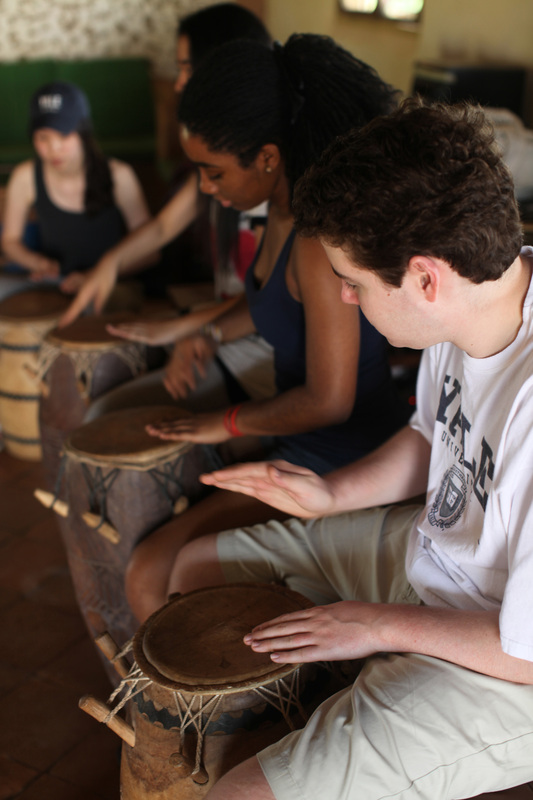 The chanting and drumming was enthusiastic and impressive, and eager to share their music, the group begged us to listen to one more song. It was great to see the community come together through music, friendship and tradition despite the dire circumstances. 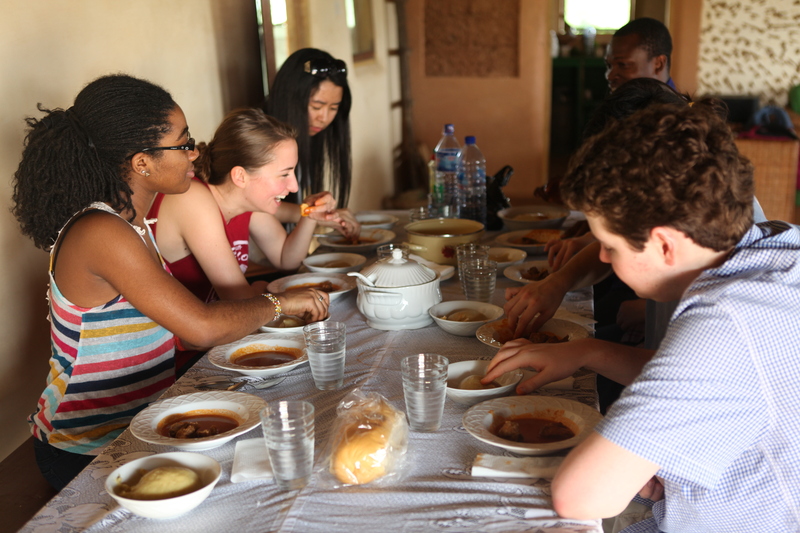 We ate a picnic lunch of Waakye (rice and beans with cassava) at Isaac’s construction site and enjoyed Fausti’s fantastic spaghetti with tomato sauce, dry cole slaw and various other delectables. We even had leftover food to share with some of the refugees, although we had to replenish our water as we went to work under the hot sun. Our first task was to paint over a cement trim around a house Isaac was working on. We mixed the paint and applied it to the wall. Meanwhile, Yaa and Becky dug some holes in a plot, and we filled them with water to lay a moist foundation for the next structure. We then shoveled piles of soil to mix cement and removed organic debris. As we worked, Isaac explained he is able to keep the costs of his houses low by taking on young volunteers willing to fund part of the project, which aims to build 1200 houses over the next two years. Isaac’s business model shifts the burden of payment off the refugees’ shoulders as much as possible. Isaac is a regular Robin Hood: only instead of stealing from the more fortunate, he offers a life-enriching experience. 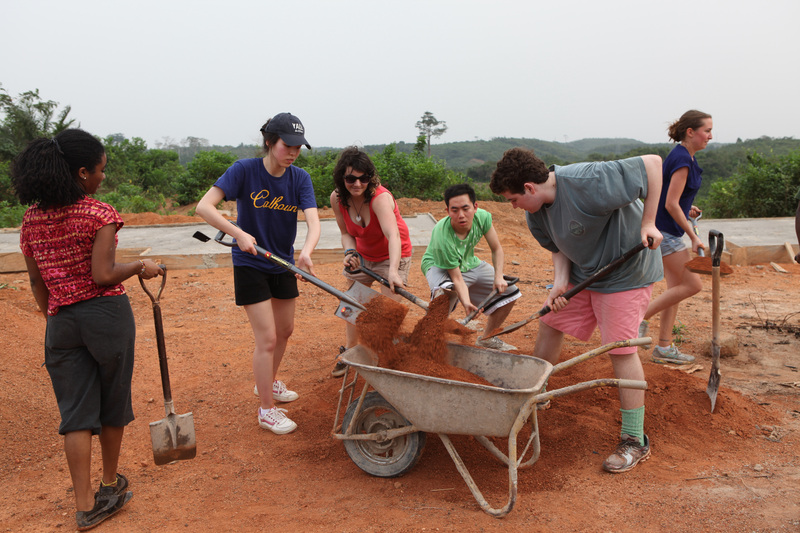 After mixing the soil, clay and mud with shovels — arduous work! (ipod speakers + Paul’s dance party playlist a necessity) — came the fun part. We formed an assembly line and operated a hydraform, a machine that transformed the mix into brick-shaped blocks, then passed the wet bricks down the line and stacked them. Often bricks would start to crumble, and we would send them back to be dissolved and reformed. Our group played a Ghanaian hand game in between passings, which the refugees seemed to get a kick out of. 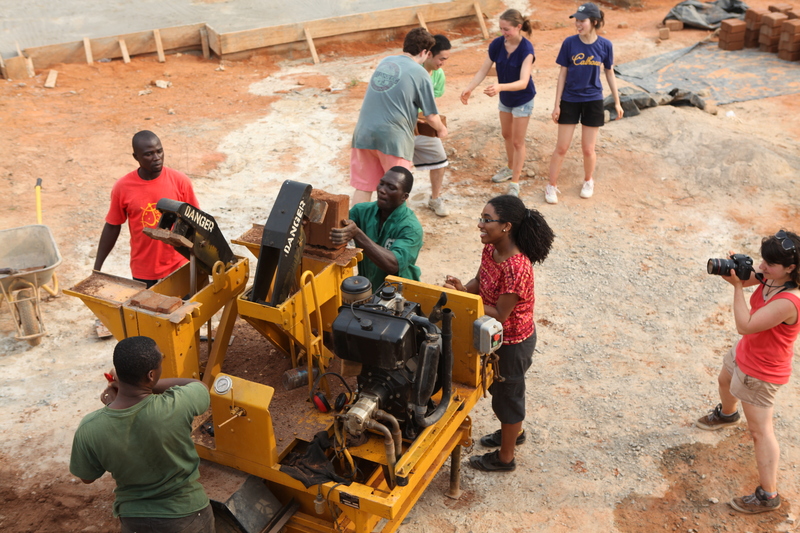 A small crowd gathered to watch us and admire Isaac’s workmanship and design. Gye Nyame – “Except G-d”. Gye Nyame is an adinkra symbol that means that “except Nyame (G-d)” nothing else can make or break us. G-d outlasts everything. 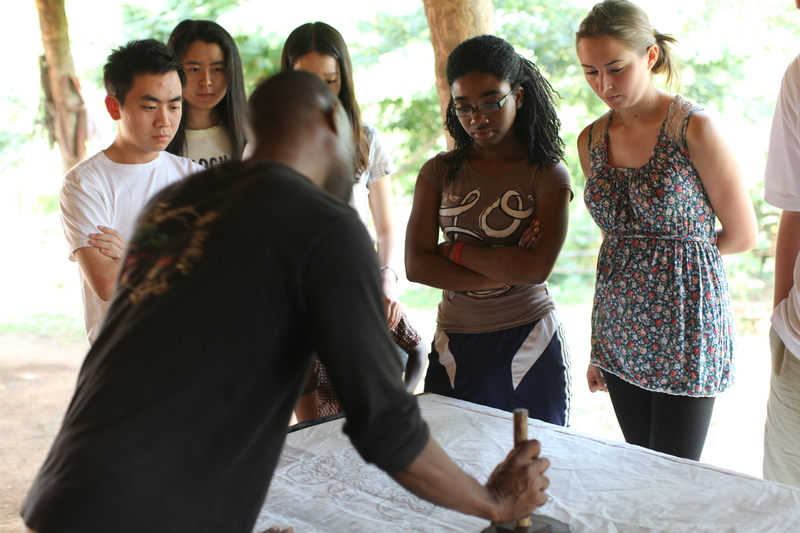 Adinkra symbols are Akan traditional symbols that tell specific proverbs and messages. …here it is! 2013. And we couldn’t have chosen a more amazing place to be. Fireworks, a huge bonfire, the sound of crashing waves: it was spectacular. We all stood around and wished one another “Afehyia Pa” and then began the new year; breaking it down on the dance floor. Some Ghanaian people there taught us a bit of the local modern dance (Azonto). It was at this point of the trip that we realized we had become a family. In a span of 4 days, we had grown so close to each other and were having so much fun. I was happy to be starting a new year with amazing new friends. On our way back from the beach, we encountered our first hitch of the year, and it was only 2:30am! We got pulled over at a Police barrier. At this point, we were not even sure what for; according to our guide Yaw, the police seemed to be looking for some New Year’s “bonus”. After being held up for a while, we were finally let go once our driver had bargained down to a “reasonable” bribe. We came back, and after what seemed like just a nap, we were up again to begin the day. 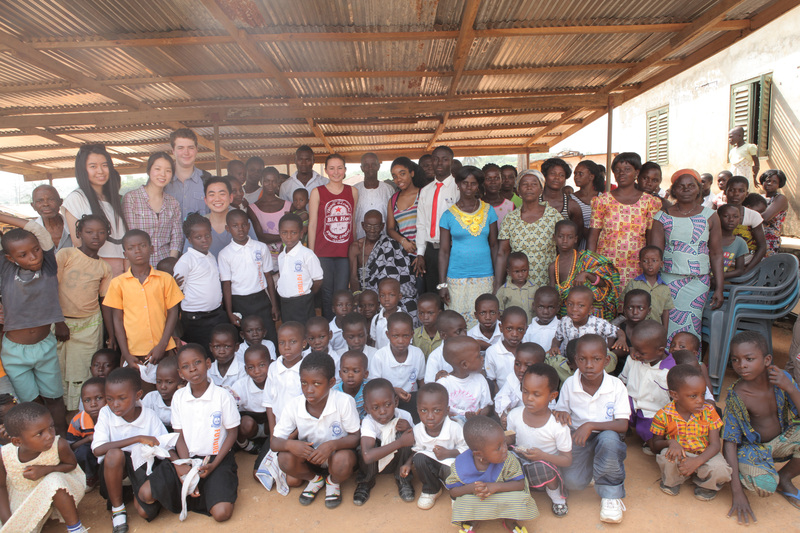 The main agenda for the New Year was to visit the Akoanso school and see class in session. We were very thankful for the teachers and the children, who were giving up their holiday to help us carry out our research. They had also been giving up most of their holiday to prepare for our arrival, and it goes without saying that the gratitude we felt was mixed with a bit of guilt. Our first impression of the school: tiny. The 90-something children that attend the school from Kindergarten to 3rd grade all have class AT THE SAME TIME in one room, partitioned only by sheets of ply-wood into three sections; kindergarten, class 1&2, and class 3. We were dumbfounded. We thought we were prepared for what we would see after our interview with Faustina a couple of days before, but nothing could have prepared us for what we met. Noise for each class flows into the other partitions and is very distracting, the rooms are poorly lit and ventilated, and there was the odd chicken and kitten wandering through. The most inspiring thing is that despite these conditions, the children apparently perform significantly better than all the other children in neighboring schools and evidently love to learn. Additionally, if the dedication of the teachers was not already clear from the effort that went into the show we received the day before, today definitely showed this. After observing class for a while, we made some donations of books, stationery and other supplies to the school. We can never forget squeals of delight of the children when Paul pulled out a football (soccer ball). We finally allowed the children to go home and celebrate the well-deserved holiday, but not without a sugar high stimulated by Dum Dums, candy canes and chocolate. We then interviewed some of the older children and were stunned by some of the things we heard. From their future aspirations to their requests for a better school, we were convinced now more than ever that this is definitely a project we wanted to be involved in. The children need this school. Our interviews with the teachers also gave us more information on the administration and potential development of the school. Lunch consisted of fried yam chips and fish, and simply put, Fausti had done it again. The meal was nothing less than delicious and by this time we were all certain of “YIRA trip-15” (in addition to Freshman 15). After lunch, we were invited to a New Year’s gathering at the nearby town of Anomabo hosted by the Twafohene (a subchief) of the area. Our day had began with dancing, but there was clearly more. The delightful brass band at the gathering fed us with some catchy tunes which led us all to the centre of the park to break it down. While some may have gotten a bit carried away by the music (no one said it was Paul), we were having a wonderful New Year’s Day so far. But there was more to come. We need not talk much about what was becoming a norm because I think we may end up running out of suitable adjectives. Dinner was all out scrumptious (or “um nom nom nom”, as we have settled on) -Fried rice and fried chicken. It has been a great start to a new year and we wish you all Afehyia pa! Person 1: A good meeting of the two years. Person 2: May the year come back to meet us all again. This is then usually followed by each person wishing something good for each other. Often said during new years, birthdays and other anniversaries. *Ewe and Frafra are 2 Ghanaian ethnic groups. Although today is New Year’s Eve and Akoanso School has been out of session for Winter Break for several days, we were invited to a special welcome event at the village square of Akoanso, which was well prepared by Faustina, teachers, and students from Akoanso School during the break. We were so amazed and entertained by the event and impressed by the hospitability that we didn’t realize that the programs actually took three and a half hours. When we arrived around 10:30 in the morning, about 150 people waiting all waved to us with huge, welcoming smiles. The kids were way too cute! They huddled together in neat, white school t-shirts -with matching socks. They looked at us, probably confused by these foreign-looking people, and I could see hope and curiosity shone in their big smiling eyes. “Yay, high five!” Then the kids all ran over and excitedly posed for our cameras. Some of them even took over my phone and camera to record the show for me. The group dances, mini-debate (Who is more important: the farmer or the doctor?) 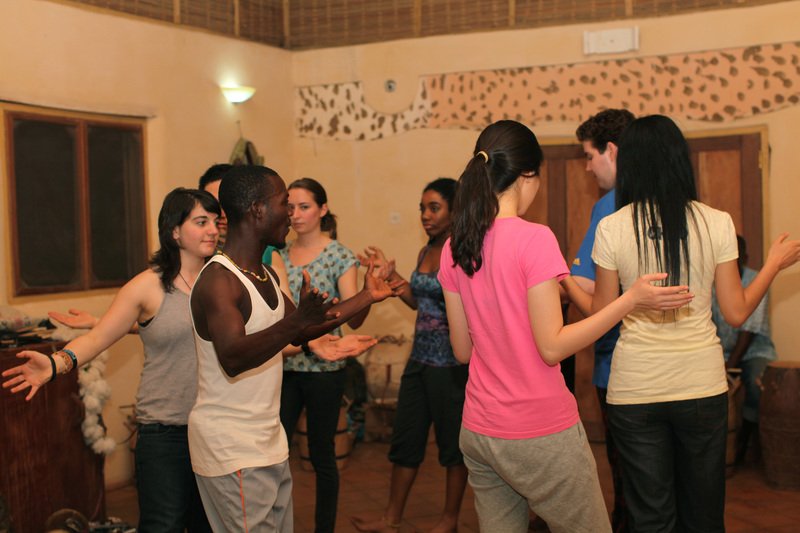 A nativity skit, “quizbowl”, and spontaneous Azonto dancing by kids totally impressed everyone. Members of the audience came up to put cedis (Ghanaian currency) on children’s heads and tucked inside their shirts as a sign of appreciation for their show. During the spontaneous dance session, we were coerced to come to stage to join them. People were all rocking out and dancing together bonded us well. After the event, many local people came to interact with us. Although the language barrier is a problem and we have a packed schedule, we will definitely want to get to know these lovely people better later! We will be wandering around for a while. After our bumpy ride in the Hulk to the eco-lodge, we found something going on outside the kitchen. We were going to have fufuu: pounded plantains and cassava. It is a popular dish of Ghanaian cuisine. It was the first time for us to see it. Some of us rolled up sleeves and tried the seemingly chill pounding chilling work, but sorry just epic funny fail. And it tasted so good! We cut some with our hands, dipped it in the delicious soup, and swallowed but not chewed. Yaw pointed out that we can chew if we want because “Nobody has any business in your mouth.” This meal totally made our day, but there is only more fun to come today! Also, we have discovered that food in general makes our team happy. Walk, interviews, and a welcomed stranger! 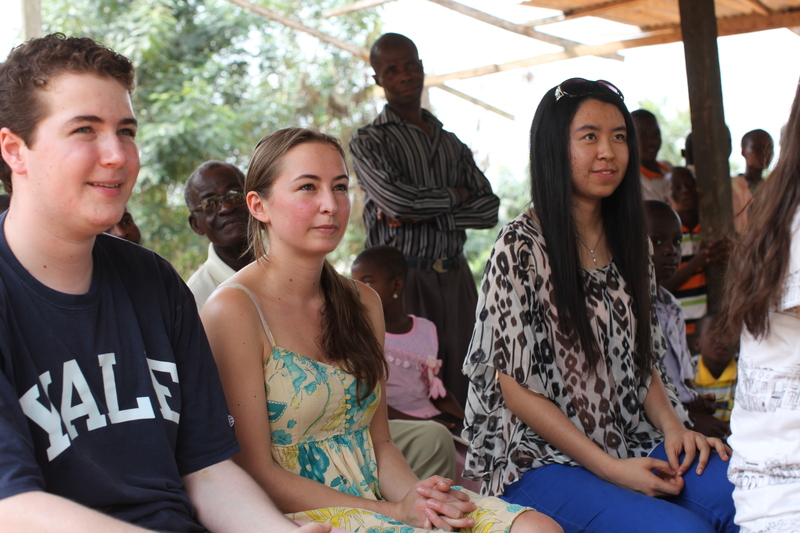 After lunch, we separated into two groups, took a walk around Akoanso, and conducted interviews with eight families. 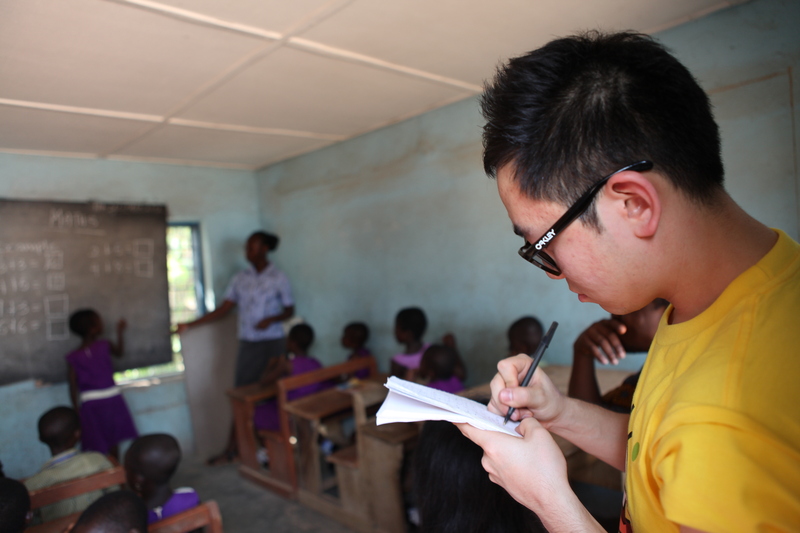 They helped us get deeper insight into what we can do for them, such as adding a playground and supplying textbooks. All the parents we interviewed believed strongly in the value of education. They were truly thankful and by the end of the day we had learned a new word: Yedaase (we thank you). After a long day of interviews and surveying the area, we met a stranger! The important thing to note is that he was super drunk but very charming. He came up to us and followed us all around for hours until we finally agreed to sit down for a drink with him. Free Guinness, and premium local beer. In addition to the drinks, the generous stranger committed to paying school fees for several children in the community currently unable to afford it themselves. When asked whether it was okay to accept the gifts from the tipsy stranger, Isaac commented “a drunk man’s money is just as green as someone else’s.” True. “If you don’t tell the truth, I will catch you!” he warned as he asked around for where we are from. We arrived in Ghana at 5:30am, and were greeted by festive green and red arches as we made our way through the airport towards immigration. Christmas music played as we wait for our baggage, which came shrink-wrapped by the airline for reasons unknown. Yaa picked us up from the airport, along with Isaac Hirt-Manheimer and Yaw Gyamfi, a Ghanaian man who will be accompanying us for the trip. We headed to Yaa’s house topick up JP, who had arrived the previous day and had trouble waking up. From Yaa’s house we drove about three hours west of the capital to the Sankofa Eco-Arts Village, our base for the duration of the trip. 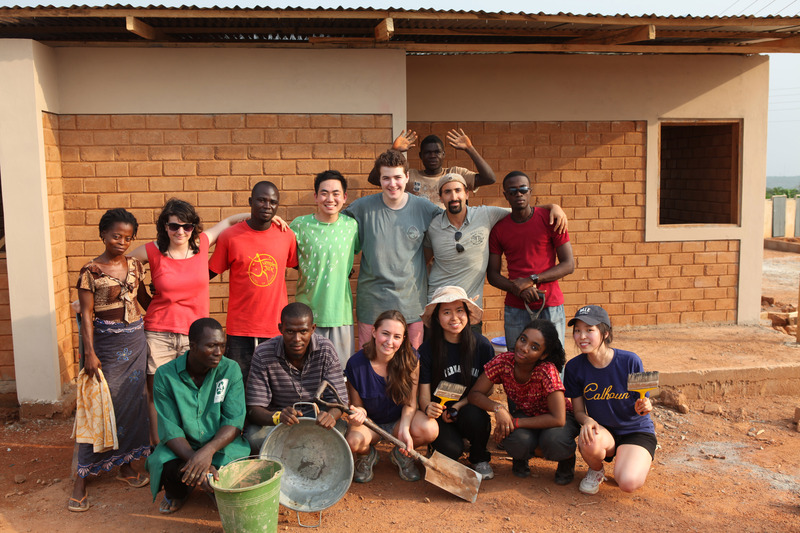 Sankofa is an ecologically sustainable guest house located in the village of Kobina Ansa, one of the communities where we will be conducting our research. The huts we are staying in are simple, clean, and pretty. 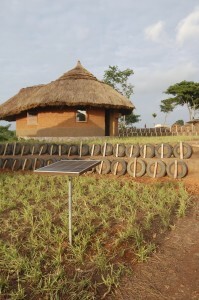 Constructed of local, natural materials such as mud-brick, thatch, bamboo, and raffia sticks, the huts use solar power and composting toilets. We eat lunch at Sankofa, cooked by Fosti, who will be making all our meals while we’re here. It’s delicious – chicken with veggies and jollof rice (rice cooked in a tomato stew).After lunch we headed to the village to meet with the chief of Kobina Ansa; Nana Bediako Ansah XI. The meeting was formal and we had to speak through a linguist (Yaw), who speaks to the chief’s linguist. Linguists are not simple translators, which would be unnecessary as the chief speaks and understands English quite well. Instead, they are meant to make our words cleaner, and put them in language appropriate for the chief’s sacred ear. Occasionally, Isaac speak directly to the chief, which seemed to be deemed acceptable since they have been friends for over a decade. After we informed the chief and his elders about our ‘mission’ as custom demands, the chief’s linguist poured out a libation in the courtyard, calling on God, Mother Earth, and the ancestors for blessings. We then passed around a cup of schnapps to symbolize the connection between everyone in the room. Everyone drank from the cup (though declining was not frowned upon) and some poured a little on the ground for the ancestors. All of us headed back up to Sankofa after that, as we were all pretty jet-lagged and in desperate need of a nap. We met up again for dinner, another tasty meal cooked by Fausina of groundnut soup with beef, rice balls and fermented corn squares, called Fante kenkey. After dinner we headed to Yamoransa, a nearby town, with Nana in the hopes of seeing a traditional religious celebration. We went to meet with the traditional priest of the town, a meeting quite similar to ours with the chief in the afternoon – linguists, libations, etc. Since the religious celebration had not started yet, we walked over to a nearby outdoor dance club. Most of us sat, talked, and sipped soda, but Paul eventually got up to dance and completely blew everyone in the club away with his break-dancing. We left a bit after 10 to see if the celebration had begun, but were told the drummers necessary for the celebration had not yet arrived. We sat in a courtyard and watched some of the children from the town drum instead – not a bad substitute, as the children in town are incredibly good a drumming despite the fact that some looked as young as 5 years old. Sadly the ceremony ended up starting too late for us to participate, so we left around 11pm to go back to Sankofa and off to bed. Zzzzzzz.